Open a new account today and claim your 100% Deposit Bonus. T&Cs apply. 1. Open an account, 2. Make a deposit of $2,500JMD* or more and you will be entitled to a 100% bonus on your qualifying deposit up to a maximum of $15,000JMD* Bonus Credit. 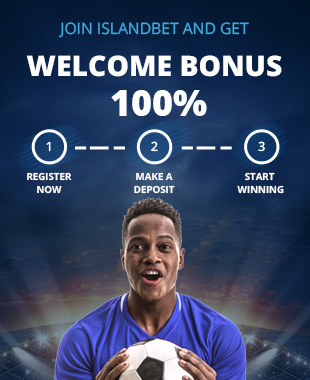 To claim your bonus, simply make a qualifying deposit, Select the bonus in MY Profile or Call our customer service desk at 876-665-2238, or email us at contact@islandbet.com after first deposit to claim your bonus proving registration and top up information. To bet with your bonus, simply turn over the amount of your deposit Six Times (6X) on the sports betting markets of your choice. You must have settled bets to the value Specified of your deposit and bonus prior to making a withdrawal. Make a qualifying deposit of $2,500JMD* or more to qualify for a 100% matched amount as a bonus to bet with. Your qualifying deposit is your largest deposit (capped at $15,00JMD*) placed in the 7 days prior to you claiming the offer. The maximum bonus that can be claimed is $15,000JMD*. For the avoidance of doubt, if your qualifying deposit is $15,000JMD* or more then you will qualify for a bonus of $15,000JMD*. To bet with your bonus, claim your offer, then turn over the amount of your qualifying deposit (capped at $15,000JMD*) Six Time (6X) on the sports betting markets of your choice of pre game betting or Live Betting (subject to conditions below). You must have settled bets to the value of Six times (6X) For Sports Betting of your qualifying deposit (capped at $15,000JMD*) and bonus before making a withdrawal (subject to conditions below). Any single bets placed at odds of less than 1.70 will not count towards any turnover requirement. In multiple bets all selection must have odds of 1.70 or greater to count towards any turnover requirement for sports betting. Bets placed on Asian Handicap and Goal Line markets, during pre-match will not count towards the turnover requirement stated. If the turnover requirements for this offer have not been met within 30 days of you claiming your offer, any funds held in your bonus balance will be forfeited. This offer can no longer be claimed after 11:59PM Time 30 days after your claim. Residents residing outside of Jamaica are not eligible for this offer. b. after you claim your offer but before you complete the turnover requirements, then any funds in your bonus balance will be forfeited and the offer will no longer be available to you. Where any term of the offer or promotion is breached or there is any evidence of a series of bets placed by a customer or group of customers, which due to a deposit bonus, enhanced payments, free bets, risk free bets or any other promotional offer results in guaranteed customer profits irrespective of the outcome, whether individually or as part of a group, Island Bet reserves the right to reclaim the bonus element of such offers and in their absolute discretion either settle bets at the correct odds, void the free and risk free bets or void any bet funded by the deposit bonus. In addition Island Bet reserve the right to levy an administration charge on the customer up to the value of the deposit bonus, free bet, risk free bet or additional payment to cover administrative costs. We further reserve the right to ask any customer to provide sufficient documentation for us to be satisfied in our absolute discretion as to the customer´s identity prior to us crediting any bonus, free bet, risk free bet or offer to their account.